Happy New Year, friends! I feel satisfied with myself in a blissful way for having decided to begin the very first blog post of 2017 with the word ‘Happy’. Isn’t that what we all strive to achieve in the long run? I had thought of writing a whole other post to commemmerate the beginning of a brand new year, but as January 1st falls on a Sunday, I had to plan otherwise. Are you still wondering what is with Sunday and this blog? Well, have you forgotten already? I know you haven’t. But on the other hand, if you somehow missed this column I posted on last Sunday, well then I would convey to you an exciting news that this blog has started a special column to be featured on Sundays. The column is titled ‘Author Talk’ and true to its name, it features authors in the form of either guest posts or interviews, such that the curious readers are allowed a peak into the awe inspiring writing journey of the writers who have already made their mark in the Indian literature scenario. Today, I am more thrilled for the author who is joining us than for the fact that the world is celebrating New Year! Most of you might know her. She is a terrific writer with an exuberant heart. Her writing is riveting, elegant and alluring. She took a leap into the Indian publishing industry with her debut novel ‘Arms and the Woman’, which was published by Rupa Publications. A part of innumerable anthologies, she published her second novel ‘Shadow in the Mirror’ in 2016 from Readomania. Well, she is not a secret anymore for you, is she? We indeed are talking about ‘Deepti Menon’, the woman with the mighty charm. 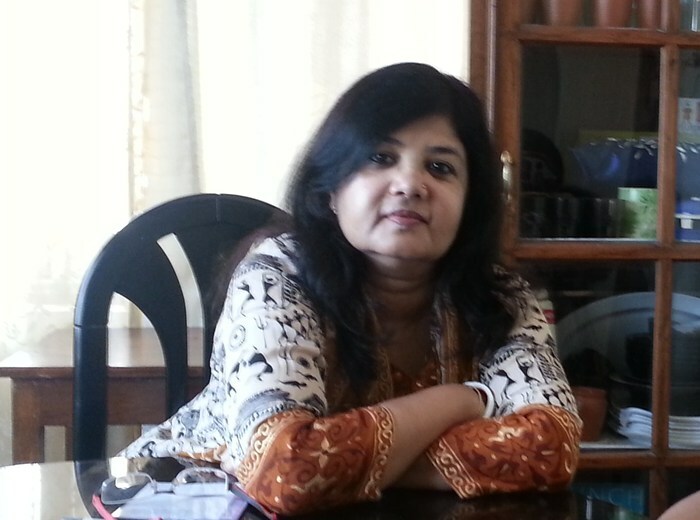 Read on to know about her tryst with writing. I am sure the post would brighten up your New Year in more ways than one! I have always wanted to be a writer. I was ten when I wrote my first poem, which was when I fell in love with the words that I had written. Reading had been my favourite pastime ever since I opened my eyes to a home filled with books strewn around. My grandparents read, my father read and wrote, my mother read, wrote and acted… so when I started reading at a rather young age, it came as no surprise to anyone. Finally, I approached a computer for the first time with trepidation, heart in mouth, as I assured my husband that I would be back to my notebook in no time. However, I soon got used to it, and today when I write articles and short stories directly onto my laptop, I wonder what all the fuss was about. I even wrote an entire novel on my laptop in a month for NaNoWriMo last year, and again, this year. Agatha Christie and Conan Doyle catapulted me into the world of mysteries and thrillers, genres which I dearly enjoy. I also recall the days when I would be travelling by train, head inside a PG Wodehouse novel, and people around would be alarmed at the chuckles that erupted from deep within me. Not surprisingly, I love humour as well. ‘Shadow in the Mirror’ was born of a tiny idea that ‘growed and growed’, as did Topsy in Uncle Tom’s Cabin. The entire story revolved around that one idea, as did the characters. However, once I had written my story, I stowed it away, and brought it out of hibernation eleven years later, when I met Dipankar Mukherjee of Readomania and my adept editor, Vaijyanti Ghosh, both of whom helped me to prune it and hone it into its present avatar. Having written for over four decades, I still find the journey enthralling, as I search for the pot of gold at the end of the rainbow. I constantly strive to write what I enjoy writing, for only if I enjoy what I write will my readers do so. I consider myself a learner still, a lover of words, fond of good writing that touches my heart and my funny bone. One quote that I dearly love is one by Mark Twain. Some of my friends and family members have dubbed me a Grammar Nazi, but believe me, I don’t do it consciously. It is just that errors pop up and hit me in the eye every single time! I am surprised I don’t have a black eye most of the time! All I would like to say is that writing should be a joy and not a chore… your words should sparkle and shine on within the hearts of your readers. If you love what you write, so will others; if you yawn as you try to finish a dreary piece, so will your readers as well. So write for yourself, and you will end up writing for others as well! It all begins with a death. Nita, a pregnant woman falling from her balcony becomes the string that unravels the plot. Her death casts a shadow over many lives; her heartbroken father, her husband and Vinny, a young journalist, drawn in by the whiff of foul play and murder. What follows are stories within stories, eras and worlds colliding with each other, leaving behind splintered relationships and mesmerizing slices of lives that appear to be drawn together and driven apart by the whimsical threads of destiny. As events cast their shadows ahead to link the stories of Vinny, Kavita, Roma, Krish and Nita in an unrelenting knot, a journey starts to uncover the truth. What is the secret that links Nita’s death to the other characters? Will Vinny be able to unravel the mystery of Nita’s death? From intimate diary entries and letters, to bantering over a meal and sharing memories while spring cleaning, this novel de-familiarizes the ordinary, presenting a kaleidoscope of our own pasts, broken edges and pulsating hearts. I could imbibe each and every word written by her and savour them to the very core. So, what did you think? Do share in the comment section before you leave. On next Sunday, we shall be meeting again with the interview of a writer who published his debut novel recently. Until then, have a fabulous first week of 2017! I did change the look of my blog as it needed a revamp and what better occasion to finally do it but on the New Year! Thoroughly enjoyed this interview Maliny! And am so happy to discover your blog through Write Tribe, it goes on my bookmarked blogs to read every Friday night. Shadow in the mirror sounds intriguing. Thanks for the encouraging words, Sunaina. Yes, she indeed is a marvel! That’s a great column for Sunday. You must continue with this series. She looks like a great author. Would love to read her. Thanks for introducing her to us through your blog. Happy New Year, Maliny! I see there is a lot of catching up to do here for me. It was nice to have a glimpse of your blogging routine and ‘Authortalk’, and being introduced to Deepti Menon. ‘Shadow in the Mirror’ promises to be an intense book. Happy New Year Maliny! I oved this interview and am ooking forward to read Deepti’s work! Inspiring by all means. Maliny have read great reviews of the book. I lived the cover. Pretty intriguing . Shall soon lay my hands on this book. I love reading about authors – their quirks and writing styles and it always intrigues me how different things work for different people. The idea of using a typewriter is so quaint. Happy New Year, Maliny! I have not read het books but am much intrigued about ‘Shadow in the mirror’. I enjoyed this autobiographical post as Deepti with a taste for Christie, Conan Doyle and Wodehouse , incidentally, my favourites too, sounds like ‘serious fun’ ! Looking forward to read her book and more from you in the series. Happy new Year, Maliny. You’ve done very well with the blog’s appearance, and this post sharing the authorial journey is so informative. Kudos. I love reading about author stories.The mystery book sounds awesome. I am a big fan of murder mysteries. Congratulations on the new look of the blog, Maliny and, of course, the new series! It was wonderful to read about Deepti and her journey into the world of writing. Four decades of writing must be so rich and deep…Could do with all the inspiration that comes from someone like her. Would love to grab a copy of her book,’Shadow in the mirror’, now that you’ve piqued my interest on that one.